No, I didn’t really write the headline to this first blog post, nor did I take or submit the photo of Jeni’s Splendid Ice Creams, in Columbus, Ohio. This was posted by my very good friend Alison Stein Wellner, who was kind enough to set up this Word Press blog for me today, when I had neither the time nor the inclination to do so. I’m leaving on an extended cross-country road trip tomorrow (well, really in about six or seven hours), and I’ve been trying to wrap up a multitude of projects all day. Alison also linked this blog to the only domain name I’ve ever registered, TheCountyHunter.com, whose name I’ll explain later. Alison just grabbed a relatively random photo from her vast database of pictures she’s taken during her travels, and it happens this particular image has relevance for me. 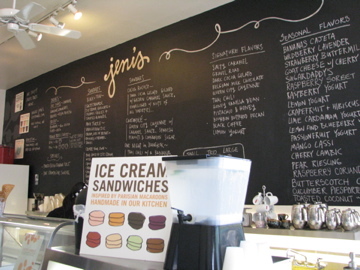 I was the one who did bring her to Jeni’s a few years ago, during a trip through Columbus. I was doing research for articles I’d eventually run on my Gay Travel site on About.com, and Alison was along to research some stories of her own. Soon after, she secured a similar guide position at About.com, on Culinary Travel. And sure enough, she’ll be joining me for at least two or three segments of this country-country adventure, which will likely take me a minimum of six months and possibly longer (right now I’ve got it mapped out through about February and covering more than 20 states). This isn’t the first time I’ve driven across country – in fact, throughout much of the ’90s, I more or less lived as a nomad, driving around the United States and Canada for most of the year. For the better part of seven years, I had no permanent address – just a storage locker and a post office box in the town in which my parents resided in Connecticut. When I wasn’t road-tripping, I stayed with friends and relatives in New York City, Boston, Connecticut, and New Hampshire. But it has been nearly a decade since I’ve embarked on one of these round-the-continent escapades, the last one dating to shortly after 9/11. And I’m very excited. So excited that I’m still up at nearly 4 in the morning. Tomorrow’s kick-off will, if all goes well, lead me from my home in downtown Portland, Oregon to the Montvale Hotel in Spokane, Washington. Here’s the route on Google Maps. I really do like (“yearn for” wouldn’t be putting it too strongly) Jeni’s Ice Cream, by the way. She was an early pioneer of salted-caramel, and the pistachio-and-honey flavor is pretty impressive, too. Drop by one of five shops the next time you’re in Columbus. I’m willing to bet you’ll like this ice cream, too. This entry was posted in Hotels, Ice Cream, Ohio, Washington. Bookmark the permalink. Tell Alison, I’d like to follow your blog but didn’t see a button. Mine is: http://travelwriter-liz.blogspot.com/ Have a great trip. PS If ever you need reliable sitters…we are available after May 2011 and the Pacific Northwest is on our list of places to stay…just sayin’! Milwaukee County, Wisconsin – Portland’s Doppelganger?